Rose and walked Mix, breakfasted and met up with Tom and later with David. 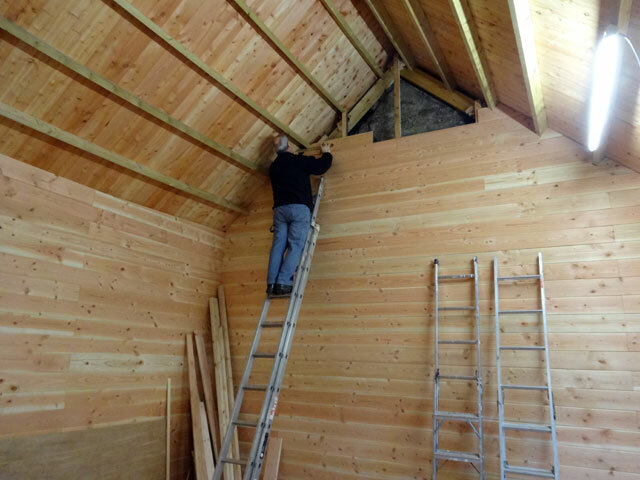 We continued with the Bothy – these last boards cutting around the beams take ages. Tom went off to take possession of his new house in Gavinton and David and I subjected the Bothy to a major clean up (and drank some coffee). Tom returned and we made a sprint for the line, completing the last sections of the final wall just before eight o’clock in the evening. It felt really good! I dined on my own (having missed my evening meal) and then collapsed in front of the television where I watched a recording of the final episode of Grantchester. It has been a very good series. Walked Mix and retired to bed. Perhaps I will have a long lie tomorrow morning. It has been a very good week.